You know that pollen is in the air when you start seeing everyone walking around wearing surgical masks. Way back, when I first saw some Japanese person wearing one of these, I immediately assumed he was crazy and I wondered why he wasn't brandishing a knife or at least talking to himself. Eventually I figured it out and now it's as normal as everything else in Japan. What I was unprepared for though, was starting to develop allergy symptoms myself. Why me? The first few years in Japan were spent in allergy free heaven. Back in Canada, ragweed destroys me every autumn, but here I was safe! Well at least I used to be. I can feel my eyes burning even as I write this. I heard that this year the pollen levels are thirty times higher than they were last year. Thirty times! So should I wear a mask? There's kind of an unwritten rule here that foreigners, well at least Western people, don't do that kind of stuff. It's the same thing as using an umbrella when it's snowing. We just don't behave like that in Canada. 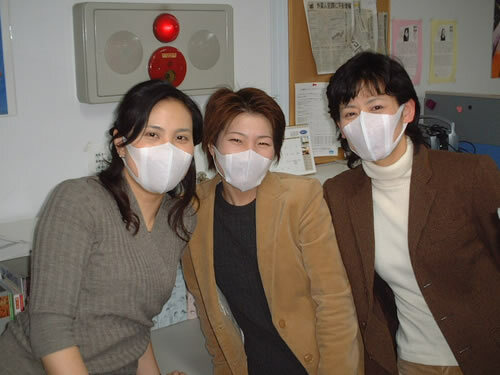 With respect to my homeland, I don't want to be the first Canadian in Japan who wimps out and wears a mask.